Happy new year everyone! I hope you all have had a splendid winter break. By now, club dues should have been submitted. Thank you to all of the clubs that turned in your dues on time; your dedication is much appreciated. I will be contacting clubs that have yet to do so. With the leadership change, I completely understand that there was a lack of communication, and I am here for and to help all of you. Please RSVP by January 31 to let me know how many members will be attending. Ideally, I’d love for as many members and all officers to attend. 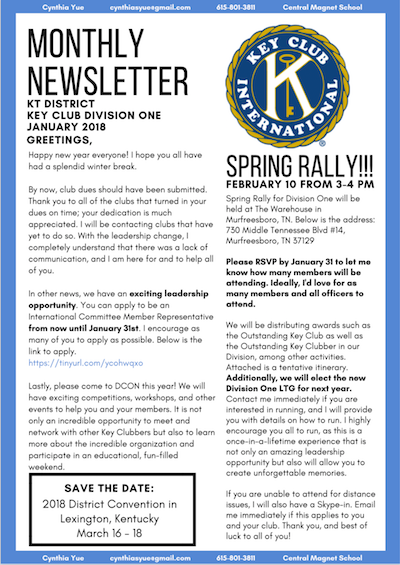 We will be distributing awards such as the Outstanding Key Club as well as the Outstanding Key Clubber in our Division, among other activities. Attached is a tentative itinerary. Additionally, we will elect the new Division One LTG for next year. Contact me immediately if you are interested in running, and I will provide you with details on how to run. I highly encourage you all to run, as this is a once-in-a-lifetime experience that is not only an amazing leadership opportunity but also will allow you to create unforgettable memories. If you are unable to attend for distance issues, I will also have a Skype-in. Email me immediately if this applies to you and your club. Thank you, and best of luck to all of you! In other news, we have an exciting leadership opportunity. You can apply to be an International Committee Member Representative from now until January 31st. I encourage as many of you to apply as possible. Below is the link to apply. Lastly, please come to DCON this year! We will have exciting competitions, workshops, and other events to help you and your members. It is not only an incredible opportunity to meet and network with other Key Clubbers but also to learn more about the incredible organization and participate in an educational, fun-filled weekend.